In this work, we first describe the population variability in hepatic drug metabolism using cryopreserved hepatocytes from five different donors cultured in a perfused three-dimensional human liver microphysiological system, and then show how the resulting data can be integrated with a modeling and simulation framework to accomplish in vitro–in vivo translation. For each donor, metabolic depletion profiles of six compounds (phenacetin, diclofenac, lidocaine, ibuprofen, propranolol, and prednisolone) were measured, along with metabolite formation, mRNA levels of 90 metabolism-related genes, and markers of functional viability [lactate dehydrogenase (LDH) release, albumin, and urea production]. Drug depletion data were analyzed with mixed-effects modeling. Substantial interdonor variability was observed with respect to gene expression levels, drug metabolism, and other measured hepatocyte functions. Specifically, interdonor variability in intrinsic metabolic clearance ranged from 24.1% for phenacetin to 66.8% for propranolol (expressed as coefficient of variation). Albumin, urea, LDH, and cytochrome P450 mRNA levels were identified as significant predictors of in vitro metabolic clearance. Predicted clearance values from the liver microphysiological system were correlated with the observed in vivo values. 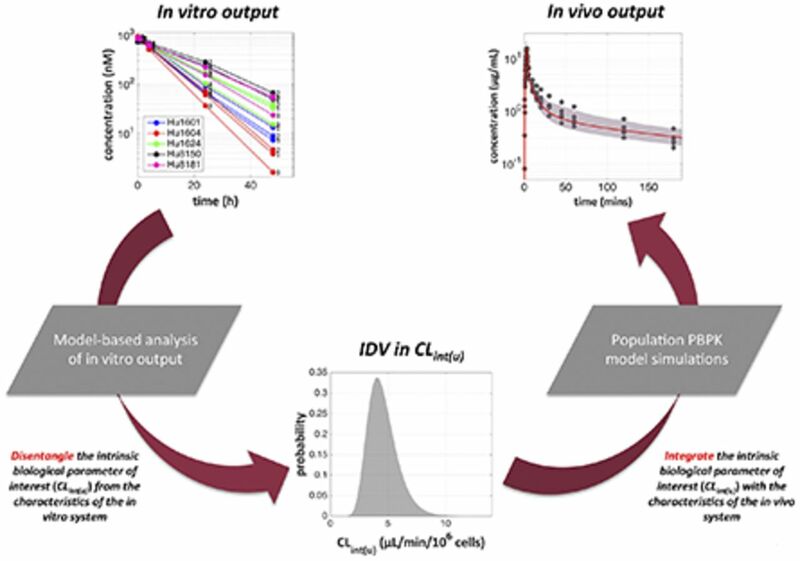 A population physiologically based pharmacokinetic model was developed for lidocaine to illustrate the translation of the in vitro output to the observed pharmacokinetic variability in vivo. Stochastic simulations with this model successfully predicted the observed clinical concentration-time profiles and the associated population variability. This is the first study of population variability in drug metabolism in the context of a microphysiological system and has important implications for the use of these systems during the drug development process. ↵1 N.T. and T.K. contributed equally to this work. This work was supported by the DARPA Microphysiological Systems Program [Grant W911NF-12-2-0039] and the National Institutes of Health Microphysiological Systems Program [Grant 4-UH3-TR000496-03].